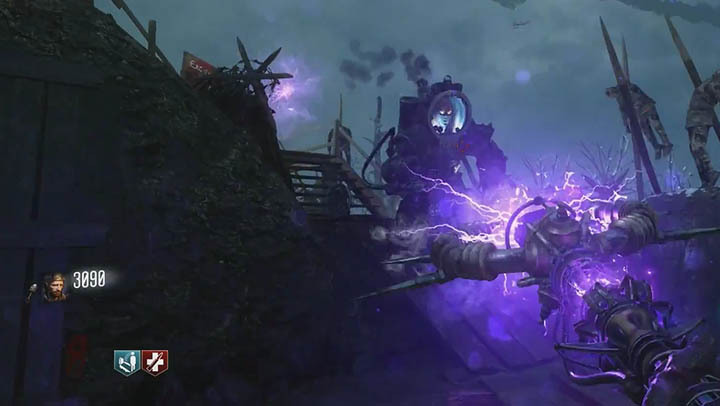 The Lightning Staff is one of the underloved staffs in Origins, mainly because of it's time consuming part collection and upgrade process. In this guide I'll show you a faster way to get this done and also cover the complete steps for upgrading the Electric Staff and enjoying what is an excellent adversary. As usual, the guide contains a detailed walkthrough together with puzzle solutions and screenshots to help you out. All of the original staffs have been preserved and remastered in the Zombies Chronicles (DLC 5) pack for Black Ops 3. Their attacks remain the same and their build and upgrade processes are also identical. Upgrading all of the base staffs to their Ultimate versions is also one of the steps for the main Easter Egg. Like the Wind Staff, the Lightning Staff bares a strong resemblance to an existing Wonder Weapon. The weapon in question is the DG-2, or Wunderwaffe as it's known, which dates back to the original World at War zombies series via it's introduction in Shi No Numa. As you might expect the base Lightning Staff shoots electric bolts of lightning that electrocute zombies caught in it's path. It's Ultimate super attack fires a larger ball of electricity that chains from zombie to zombie, killing many zombies in a close knit horde. In addition to its electric attacks, the Ultimate Lightning Staff also has a high round one hit melee attack (up to round 16) and also an alternate mode. Pressing the left directional pad causes the staff to flip around, allowing the player to instantly revive a teammate with a burst of energy. The Lightning Staff requires 3 PURPLE parts, 1 PURPLE coloured disc, 1 black disc and the gramophone. You must have all of these before you can build the base version of the staff. The Purple parts are well hidden in the Origins map and are ONLY accessible by riding the tank (from the church) and jumping off onto secret platforms. This will cost you a few points and a fair amount of waiting as the tank recharges to complete a full lap. Part 1 - after riding past Generator4 (Jug), wait until halfway along the muddy path then jump to the RIGHT side, onto the wooden platform. Part 2 - ride the tank from Generator 2 (Tank Station), as you approach the excavation site look for the wooden platform on your LEFT. Jump across and walk above the excavation site to claim the part. Part 3 - after part 2 location above, as you approach the church, jump to the RIGHT side of the tank onto the snowy walkway with the broken fence. Work your way around the back of the church and claim the part. The purple disc is always in one of three locations near to Generator 4 (Jug). Head to the tunnel by Generator 5 (Stamin-Up) and go underground to the very end of the tunnel. Place the gramophone down on the table to build the purple portal that'll take you to the Crazy Place. Venture through the portal to the Crazy Place and pick up the crystal from the purple pedestal. Then leave the crazy place by rebuilding the purple portal again. Finally, go to the lower level of the excavation site to build the Lightning Staff in front of the statues. The upgrade steps for the Lightning Staff were originally highly annoying but have since become a little easier. Follow the exact steps below and pay attention to the puzzle solutions to save some time. Go to the Crazy Place and take note of the sequence of purple triangles by the purple portal area (shown in the image above). These "notes" form the first upgrade puzzle which thankfully is always the same every game. To solve this puzzle, ignore the top row of notes and number the bottom row from 1 - 7. Now use the Lightning Staff to shoot the notes in the exact order shown below: (ignoring the top row entirely). If done correctly you'll receive an audio quote from Samantha and the ground will shake. 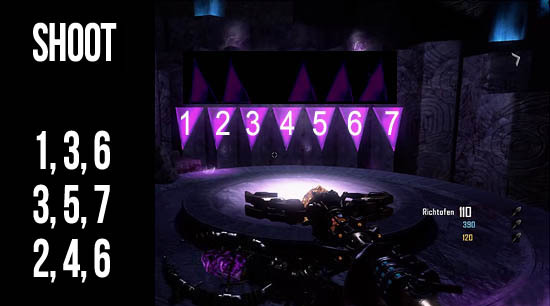 Before Treyarch patched this step, players had to repeatedly find and check 8 different panels looking for the next sparking dial. In SOLO this was an unbelievable pain and ending up being the main cause for the unloved Lightning Staff. Thankfully this step has been changed. Follow the exact locations below, going from panel to panel, turning the dial to the exact position mentioned. You can also turn the dials whenever you want in the game, saving time before you get to this step. Notice how there are only 7 mentioned above, this is because the 8th panel never sparks so I have ignored it. If done correctly there will an audio quote from Samantha and a beam of light will shine up from the excavation site and into the sky. At the bottom of the excavation site there are four large rings with coloured gems on the side. Use the switches in this area to turn each of the dials until they are all purple. When ready, shoot the purple orb underneath the rings (using the Lightning Staff) to shoot it upwards. The final upgrade step requires you to go back to the Crazy Place for one last challenge. 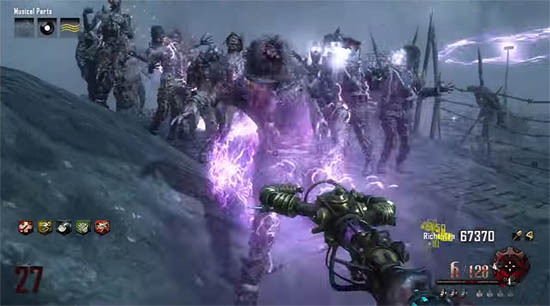 Place the Lightning Staff in the purple pedestal and kill 20-30 zombies in the Crazy Place (anywhere you like). I strongly suggest having an upgraded weapon for this and preferably some kind of protection such as Jug, the shield or a reliable teammate. Once complete, pick up the staff from the pedestal and the Ultimate Lightning Staff Is your to enjoy! Well done, your hard work has been worth the effort!